Reckitt Sells Food Business to McCormick & Co.
McCormick and Co the spices maker based in the U.S. has agreed to acquire the food business of Reckitt Benckiser Group for $4.2 billion, which is higher than was expected and gives it a bigger sauces and seasonings portfolio. Reckitt, based in London, said last April it would review its options for this unit, which includes Frank’s RedHot sauce and French’s mustard, to lower its debt following the purchase for $16.6 billion of Mead Johnson the maker of baby formula. The acquisition added another product line and increased its business across the United States and developing markets. The sale, which the companies announced late Tuesday, will lower the net debt to EBITDA ratio at Reckitt from 4.1 times to 3.3 times. It enables the company as well to focus more on its consumer home and health brands that include Mucinex cold medicine and Durex condoms. The deal gives McCormick, which makes Old Bay, Billy Bee honey and Lawry’s, a lead position in the condiments category in the U.S. The price of $4.2 billion represents an over 7 times multiple of annual sales of the business and over 20 times earnings prior to EBITDA. That is far higher than the average over the long term for major deals in this sector, which analysts said is 3.3 times sale while 16.2 times the EBITDA. Sources previously had estimated that the food business, which had attracted several other players in the U.S., would be sold for approximately $3 billion. Analysts in the industry said the price was very high for a U.S oriented food business. 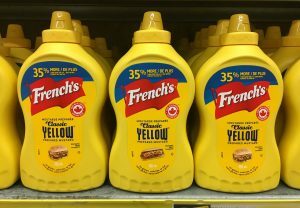 Another group of analysts on Wall Street said the higher price tag gave confirmation to value put on some unique assets such as French’s, which is the leading mustard brand worldwide. On the news, shares of Reckitt were up by 1.3%. McCormick, which is expecting its hot sauce sector to continue its robust growth, had attempted to expand. In 2016, McCormick approached the owner of food brands in Britain Premier Foods that has products such as Oxo stock cubes and Mr. Kipling cakes but was pushed back. With the deal, McCormick is expecting to have meaningful accretion to adjusted per share earnings and margins, excluding the costs for the transaction and integration. McCormick expects to have over $50 million in cost synergies of which most will be seen by 2020.